We often receive enquiries for our PAT testing courses from people looking to start a small business making and selling small electrical items, typically lamps and other lighting products. This article provides some information on the basic requirements for selling lighting equipment in the UK. 230V Lamps need to comply with the Electrical Equipment (Safety) Regulations 2016 and as such must be CE marked. Before CE marking a product you will need to create a Technical File, carry out a Conformity Assessment and sign a Declaration of Conformity. The technical file should contain information on how your lamp meets the safety requirements. This would normally include a product description, drawings, wiring diagrams, parts list, test reports, quality control procedures etc. Complying with a product standard is not compulsory, however in practice it would be difficult to carry out a conformity assessment if it doesn’t meet a product standard. 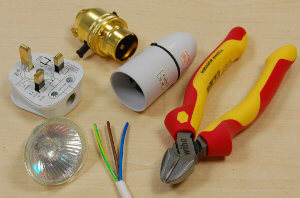 BS EN 60598 is the main standard for lighting equipment. The standard comprises of two parts. 60598-1 covers the general safety, construction, marking, wiring and testing requirements. The second part, 60598-2, is a series of accompanying standards with the requirements specific to the lighting type and application. The most relevant to most lamp makers will be 60598-2-4 Portable General Purpose Luminaires. BS EN 60598-1 specifies the maximum values for the electrical tests. The earth continuity should be measured with a minimum test current of 10A. The requirement for a 10A test means that most battery operated PAT instruments are unsuitable for production testing. The high current test ensures the earth path has a sufficiently low resistance and also detects any weak points, e.g. a single-strand connection. Most approval organisations, such as ASTA BEAB, recommend using a test current of 25A. The maximum allowable value is 0.5 Ω, however we would recommend using the lower limit of (0.1+R)Ω, as required by a standard PAT test. The electric strength test (also called hipot, dielectric strength, or flash test), is used to determine the effectiveness of the insulation by applying a high voltage between the live conductors and metal parts and measuring any current leakage. The minimum required test voltage is 1.5 kV ac. This test is useful in detecting faults such as damaged or crushed insulation, loose wire strands and inadequate clearance distances. As an alternative to the electric strength test, an insulation resistance test can be used. This measures the resistance of the insulation using a 500 Vdc test voltage. The insulation resistance test is a less vigorous test than the electric strength, so we recommend carrying out an electric strength test where possible. There are some differences between production testing and a standard PAT test, however for most small scale makers, attending a PAT course is a good way to learn the basic test procedures that can then be applied to production testing. Lighting products are subject to EU energy labelling requirements and as such are required to have an energy label indicating their energy efficiency. The label should include the company name, the model, the energy efficiency of the lamp and the weighted energy consumption per 1,000 hours. If you sell electrical equipment you must meet the requirements of the waste electrical and electronic equipment regulations (WEEE). For most small manufacturers, the easiest way to do this is by joining the Distributer Takeback Scheme (DTS). You pay a fee that covers your WEEE obligations, with the money going towards supporting the recycling centres run by local authorities. As a manufacturer there is always a possibility that one of your products could cause damage to a third party; that could be property or another person. Product liability insurance is not a legal requirement, but is does cover you against claims made against your business. This website is provided for information purposes only and while every effort has been made to ensure that information is accurate and up-to-date, we cannot guarantee accuracy and we are not responsible for any errors or omissions. We therefore recommend that you carry out your own research and seek professional advice where necessary.